All parents with school-aged kids have to prepare for spring break, and that in itself, depends on a few factors: one being the child/children’s ages and two being the type of activities you want to engage in. The last and third factor is the amount of money you’re willing to spend. Our kids are the tender age of 3 and 4; they have the energy and curiosity to be entertained with just about anything, making it easier to plan vacations. Since the previous years were spent out of town, we wanted to incorporate spending time with family this year. My mother-in-law lives in south Florida, so we headed that way to spend the break. We stayed at the Hilton Marina in Ft. Lauderdale — the hotel is alongside the bay where the boats are docked and pass through the waterway. Many who choose to stay at this hotel are most likely going on a cruise since it's located near the port. When we arrive, we were greeted by an impressive view of the docks from the hotel lobby. Although the lobby was smaller than the other Hilton hotels we’re used to, it still had all the essential amenities like a bar area, sitting lounge, and a coffee lovers dream: Starbucks. The outside deck had a decent sized pool with a bar lounge. According the hotel’s website, our rooms were supposedly renovated. The hallway carpets were worn out and I was mostly disappointed with the bathroom. The shower tiles were rusted, it was poorly cleaned, the light fixtures were dusty and could use polishing. The best amenity in the room was the balcony overlooking the bay. Even though this Hilton hotel was pricier than others we’ve stayed at, due to the location, I don't foresee a complete overhaul renovation on the hotel rooms. People are paying for the views and location. Hilton is able to skim on the quality of the rooms and get past on their brand name and location. Saturday: the family headed over to the world famous Zoo Miami. I was overwhelmed by the magnitude of the zoo — it was so large that it offered bike rentals, accommodating for any sized family. Renting a bike was the fastest and best way to cover the zoo grounds. We were able to feed the giraffes, go to the petting area, ride the merry-go-round and of course see all the different zoo animals. The kids love learning about the different animals. I love it when they ask me about each one of them. The adults did all the peddling and we had a full workout carrying the weight of the kids. We loved every minute of it! Sunday: we took the kids to The Frost Museum — it is four levels of absolute fun. It's a science-filled museum with an impressive aquarium. The day seemed to go by slowly because there is so much to take in. We watched a short film about the environment, analyzing various animal species. The Frost Museum is hands-on, allowing everyone to interact with certain exhibits. The fourth floor has a panoramic view of downtown Miami. Later that day, we went to Bayside Market Place Miami for a late lunch/early dinner. Bayside Market Place is an outdoor shopping center with several restaurants. The dockside of Bayside had boats of many sizes for people to go on a mini trip along the coast. We felt adventurous and decided to do the speed boat that took us by the celebrity homes. The kids seemed to love it and my wig nearly flew off... literally. The Miami trip was the first leg of spring break. The last leg was in our city of Orlando. We love a good old staycation. Last year, we had such a wonderful time at Hilton Orlando Buena Vista Palace hotel that we decided to stay there again. I can’t express how much I love this Hilton Hotel. It checks off all the qualifications in my box. Hilton Orlando Buena Vista Palace hotel is our home away from home. With its impeccable family oriented culture, they have a warm and friendly vibe. We received a rate for the first two days that was incredible. The first room was located in the tower of the hotel overlooking the entire Disney Springs on the twelfth floor. It was different from last year’s room that was more of a suite with a living room and a separate bedroom, two bathrooms and two balconies. Even though it didn’t have all the bells and whistles from last year’s visit, we loved being up high. The room was still spacious enough for our family of four. One missing balcony was not going to put a damper on this great hotel. The rest of the room was modern and updated. We arrived at the hotel later in the evening. We had an eight o’clock reservation at the T-Rex Café located in Disney Springs. 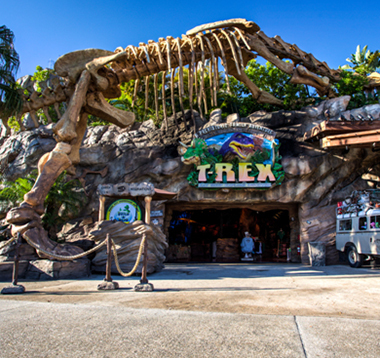 The T-Rex Café did not disappoint, with its elaborate-themed dinosaur decor. 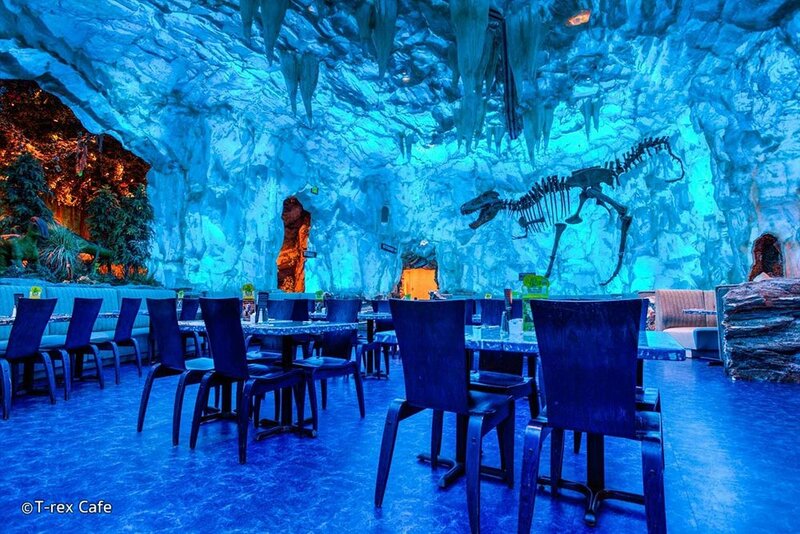 Every nook of the restaurant brought you back to prehistoric times. The food was delightful along with the service. One of my favorite amenities of the hotel is the lazy river. There's a separate pool area along with the beauty of having a relaxing movement on the lazy river. Our son practically wanted to spend the entire time in the pool. My husband and I did separate activities on Friday to accommodate both kids’ wants. Our daughter wanted to spend the day at Epcot, so daddy stayed and played in the pool with our son while my daughter and I headed over to Epcot. Epcot is having its festival of flowers, so we got to experience that! I'm always in awe when I go to any of the Disney parks. The attention to details soars above the stratosphere. Disney has a way of adding extra details to the least of things. Caity and I experienced Talk with Crush, taking pictures with Pluto, gawking over the beautiful sculpted floral designs of memorable Disney characters, gazing at the huge sea aquarium with all types of sea creatures and people watching for me. We went to Disney Hollywood Studios on day two of our staycation. Hollywood Studios is perfect to watch Disney’s mini shows all in one place. We were able to check out Star Wars, Mickey’s Dance Party and the Little Mermaid. We didn't stay too long because the kids wanted to go swimming in the hotel pool. My husband kept saying he had a surprise for us. When he booked the rooms, it was at a discounted price for the first two days, so we would have to change rooms on the third day. I thought the room surprise meant memorable Disney items. The kids and I were more than surprised to see that the new room was a two-floor suite! It looked like a townhouse inside of the hotel. I thought the first room we stayed at last year (see post Staycation at the Hilton Buena Vista Palace), was beyond perfect for our family and luxurious. The new suite was over the top spacious and luxurious, with two bedrooms on the second floor and a full-sized bathroom. The master bedroom had a separate study area. Wait for it — the en-suite bathroom was like something out of HGTV. Two comfy plush robes were nestled in the closet. The feature that had my eyes doing fireworks was the huge dual-head shower. This is perfect for my husband and I. We still had space to shower without someone being left out in the cold. During our last night, we decided to order room service and eat dinner on what I called the last supper table. After we put the kids to bed, papa bear and momma bear hung out in the living room watching movies. Sunday, the last day of our staycation, we had our final breakfast at the hotel café. However, this particular day was different from the other days. Three of the Disney characters were at breakfast greeting and taking pictures. Our kids were able to meet and take pictures with Pluto, Goofy and Minnie Mouse. That concludes our spring break with the kids. Where shall we go next year?